It shouldn't come as a surprise to learn that we think Scrabble is pretty darn awesome. It's words and healthy competition and yelling "That's NOT a word!!" and rummaging through the OED to prove it. What isn't awesome is rings of doom from cups and glasses on a table. The obvious solution then is Scrabble coasters. These coasters by Wild and Wolf are made from beermat style card and come in a little tin. 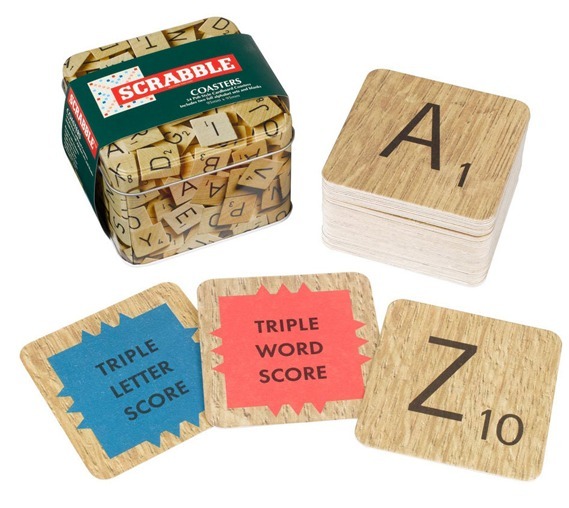 So you could either have a giant game of Scrabble down the pub or line up your drinks to get the perfect triple word score. Want them? They're £12.95 from HarlemUK.